Presently, with society’s advancements in the fields of science, medicine and technology, heat therapy has been developed and refined. It is proven to be the most effective way of soothing muscle spasms and is recommended by medical professionals. Further studies proved that some types of heat are more helpful in soothing muscle pain than others. Heat emitted by carbon fibers, for instance, produce Far Infrared Rays which is more effective than superficial heat produced by heated cloth, hot water bottles and instant hot packs. Far Infrared Rays (F.I.R.) are active waves of invisible light that produces radiant heat. Far Infrared Rays are emitted by the sun and all carbon-based living organisms on Earth and are considered natural and safe. 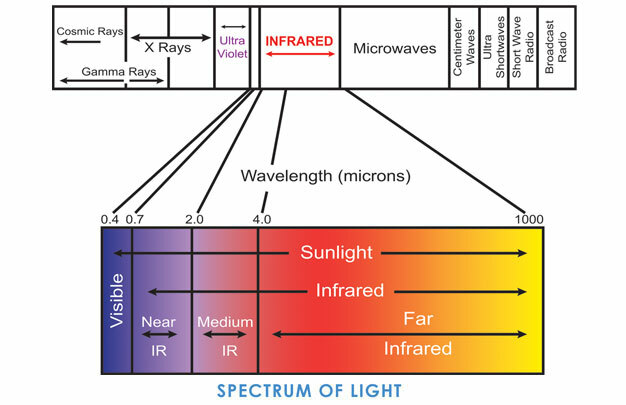 The light spectrum diagram shows that F.I.R. is found between the visible light and microwave, a type of invisible light wave used in ultrasound. This is in direct contrast with the harmful ultraviolet light, which causes sunburn and skin damage. A 25-year research from China, Japan and NASA proves that Far Infrared Rays with a wavelength of 4 to 16 microns are the most beneficial to human health in the cellular level. A great ability of Far Infrared Rays is penetrability. F.I.R. could reach approximately 2-3 inches below the skin without damaging it, accessing blood vessels, tissues and muscles. The pain alleviation process happens in the cellular level when F.I.R. light energy converts into heat upon contact with the subcutaneous tissues in the body. The heat energy excites the molecules, causing them to have micro-vibrations. 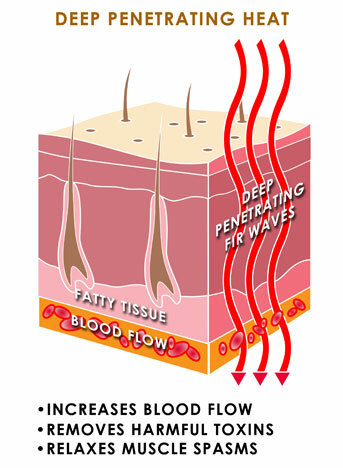 This process causes the blood vessels to dilate, which in turn boosts blood flow in the area. The improved blood flow makes it quicker for the blood vessels to carry and resupply vital nutrients and oxygen needed to recuperate the area in pain. Furthermore, Far Infrared Rays help get rid of toxins and metabolic wastes in the body through sweating, which is the body’s natural way of cooling itself from the heat that comes with the process. Far Infrared Ray-induced heat is harmless, comfortable, targeted and deep penetrating. It is an effective way to strengthen immunity and improve blood flow, which eases muscles spasms, rehabilitates movement impairment, alters the sensation of pain and promotes tissue repair. With the help of a three dimensional laser scanner, significant points in the body are exactly mapped over a fast 10-second scanning session. The saved information is used to give directions to an automated computer-calibrated fabric cutter. This technology is used to accurately create perfect-fitting apparel and clothing to give the wearer one hundred percent utmost comfort. By integrating the concept of heat therapy, Far Infrared Ray light energy, and three-dimensional tailoring, the Anpan therapy team was able to develop and create a highly-valuable, first-of-its-kind, effective, and do-it-yourself Far Infrared Ray heat therapy system, specifically designed to relieve chronic physical pain. Each Anpan therapy product is guaranteed to be durable, safe, user friendly, comfortable and effective. DURABILITY: Made with fleece to easily trap heat in the painful area and Neoprene, a rubber-like material for flexibility to fit any body part, the Far Infrared Ray heat therapy system is built to last. The heating element is made out of a coil-free hair-thin heating element and Far Infrared Ray-emitting carbon fiber that will surely last a lifetime. SAFETY: Most heat therapy devices in the market today are required to use a high-voltage energy source-- this could be both dangerous and expensive. Anpan Therapy products are guaranteed safe because it uses a low 12-Volt DC Voltage for the Plugin Series and a 7.4 Lithium Ion Battery for the Rechargeable series. Anpan Therapy Products are also free from harmful Electromagnetic Field Frequencies that may cause cancer, brain tumors, birth defects, headaches and other health problems. The Plugin series is powered by a 12-Volt DC Voltage and is equipped with a simple 4-temperature setting and a 30-minute preset timer. The Rechargeable series uses a 7.4 Lithium Ion Battery that can last 2 to 5 hours, depending on the setting. It is also equipped with a 30-minute present timer and a 4-temperature control setting. EASE-OF-USE: Outfitted with a 4-setting temperature controller and a 30-minute automatic shut off program, Anpan’s therapy system is simple and easy to use. Just turn the controller to your preferred heat setting and you are ready for a 30-minute worry-free thermotherapy session. SUPREME COMFORT: Anpan Therapy products are made of a stretchable rubber material called, Neoprene that conforms to the contour of the area needing treatment. Adjustable with the use of Velcro, the Far Infrared Ray heat therapy system is designed to fit anyone who is in pain. It is also lightweight and battery operated, making it portable and mobile. GUARANTEED EFFECTIVE: Unlike conventional forms of heat therapy that only heats of up the skin’s surface, Anpan Therapy Products use a hair-thin heating element that emits Far Infrared Rays penetrating up to 2-3 inches into the muscles and bones, which optimizes therapeutic benefits. Likewise, it improves blood flow, aiding the blood vessels in resupplying vital nutrients and oxygen needed to recuperate the area in pain while providing a gentle and pleasant warming effect, making it safe and effective.